Thanks for your comment: I gather from your frustration that you are a fan of von Balthasar’s theology! I don’t think that Kilby’s criticism needs to be read as deeply as you feel it: there IS much to learn from Balthasar! Perhaps a more generous reception of her criticism would acknowledge that Balthasar is far from being a systematic theologian – a fact that much endears him to me personally – but also presents a difficulty for systematic theologians such as Kilby to integrate Balthasar’s contribution in their own theological projects. I think that Kilby does demonstrate humility in this book and, having read quite a bit of Balthasar myself, offers some very helpful insights as to the strengths AND weaknesses of his work. 1) One would have thought that Kilby would pay particular and close attention to the third part of the Balthasarian trilogy and its three volumes dedicated to, precisely, “Theology” or “Theological Logic”. This is the part after all where Balthasar engages with methodological and hermeneutical questions with regard to “theology” AFTER the Theological Aesthetics and Theological Dramatics. Zero. She does not engage this part of Balthasar’s ouvre AT ALL and therefore misrepresents Balthasar’s theology by failing to do so. In this respect, she mirrors the error of Quash who, in his book Theology and the Drama of History, when he makes the case for Balthasar falling back onto an “epic” mode, again quotes mostly from the Theological Aesthetics to buttress his point. Naturally, they fail to present Balthasar’s intention then in his trilogy with accuracy. 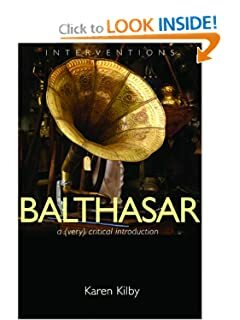 2) One would have expected Kilby to pay close attention to Balthasar’s books where methodological and hermeneutical questions are to the fore ACROSS the whole range of Balthasar’s works. There is no engagement for example with Balthasar’s critique of Barth in Balthasar’s book on the latter, nor with Rahner scattered through out his works. Interestingly, Balthasar has a more positive view of Rahner in the third part of the trilogy for example! 3) Other works are not even mentioned, like Razing the Bastions, which is after all a programmatic work that Batlhasar thinks should be taken together with Love Alone. 4) Nowhere does Kilby engage with the secondary literature on Balthasar, and she studiously avoids engaging non-English sources. Look up her bibliography; they are all in English. 5) Nowhere does Kilby deal with the SOURCES of Balthasar’s positions (as seen in his footnotes for example) in any great depth. She makes it appear therefore that Balthasar is “unfettered”, but she does not for example note the wide use of biblical exegetes that Balthasar deals with in Mysterium Paschale, pro, con, and in-between. 6) For a deep critical engagement with Balthasar’s thought then, Kilby is truly unreliable. She quotes authors like Endean, who is certainly a Rahner expert but whose knowledge of Balthasr seems utterly sophomoric. We still await therefore the work(s) that are truly and genuinely critical where Balthasar is concerned, someone with (almost) the same exposure to a wide range of theological and other literary texts as Balthasar himself. Perhaps Cyril O’Regan is one such thinker in English; he has a volume coming out on Balthasar soon (Cf. http://www.amazon.com/Anatomy-Misremembering-Balthasar%C2%92s-Philosophical-Modernity/dp/0824525620) . Vincent Holzer has written a dense book on the “le differand theologique Balthasar-Rahner” that is so much more respectable than Kilby’s. Thanks for taking the time to offer your perspective Tony. Very happy to have your thoughts considered here as a critique of the critique!